The NYIT team envisions its harmonious design. 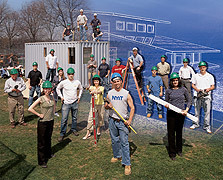 A sunspace connects NYIT's garden-roofed "Green Machine" to its PV-covered "Blue Space." We've all seen it happen. You give a child a fantastic gift and later find the kid playing gleefully with the packing box. In a similar vein, students from the New York Institute of Technology (NYIT) became intrigued with the idea of packages—and the possibilities therein. Such was their interest that they eventually decided to use a shipping container as an integral part of their Solar Decathlon house, named "Green Machine/Blue Space." "Green Machine/Blue Space" describes the two main house structures, which are joined by an enclosed sunspace. The Green Machine structure (the shipping container) contains most of the home's mechanical systems, as well as the kitchen, bathroom, and a roof garden for growing food and collecting rainwater. The Blue Space houses areas for sleeping, relaxing, and working. "Our design philosophy is to live in harmony with the Earth," says architecture student Heather Korb. That's why the soybean insulation, wheat straw building panels, and recycled rainwater are important. And then there's the hydrogen power system. "From the beginning of this project, we decided to do something very special using a hydrogen fuel cell for energy storage," says energy management student David Schieren. Electricity from a roof-mounted PV system is used to separate water into hydrogen and oxygen through electrolysis; the hydrogen is collected and stored and later used to power a fuel cell. The fuel cell recombines hydrogen with oxygen to produce a household supply of electricity. This system replaces the batteries that are commonly used with stand-alone PV systems to store excess energy. The electric system is very dynamic and allows the monitoring of numerous household circuits. At the competition, this is designed to allow the NYIT team to direct power to the places where it can best be used. This desire to do something innovative carried over to the interior of the house. "We've created 'micro-climates' of comfort inside the house," says interior design student Mary Merges. There is lighting, heat, and special furniture for individual areas, which eliminates the need to involve the entire house.